Recover lost and damaged music and more. Is there a better alternative to TuneTech for iPod? Is TuneTech for iPod really the best app in MP3 category? Will TuneTech for iPod work good on macOS 10.13.4? Universal Binary application. Optimized for Intel Macs. Streamlined user-interface on various features. Auto-renamer feature allowing ease of identifying and reorganizing the salvaged tunes. Duplicate feature allows cloning to more than a single destination. Shredding feature allows selectable number of passes. TuneTech for iPod needs a rating. Be the first to rate this app and get the discussion started! Backup: Make an exact clone of your iPod for safe keeping. This is the fastest way to backup all the music, pictures and files that are stored on your iPod. Use your backup as protection against data loss. Optimize: Increase battery life and minimize wear-and-tear. Your songs get optimized by physically putting them in order on the drive in the order that you want to hear them, minimizing hard drive access and reducing the work your iPod has to do. Repair: This is the solution if songs or playlists have become inaccessible due to software errors. If songs are missing or play erratically, repair immediately before running the risk of permanent data loss. Duplicate: Make an exact copy of your iPod on another iPod - perfect when migrating all your data in one shot from your old iPod to a newer model. 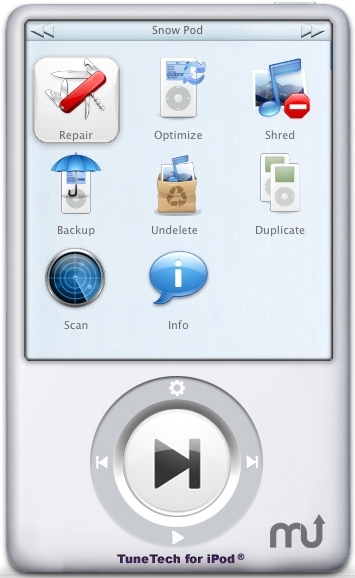 Scan: Analyze your iPod's hard drive for media defects that can endanger the data on your iPod. Info: Display detailed information about your iPod's hard drive to enable sophisticated troubleshooting. Think of it as health care insurance for your iPod.